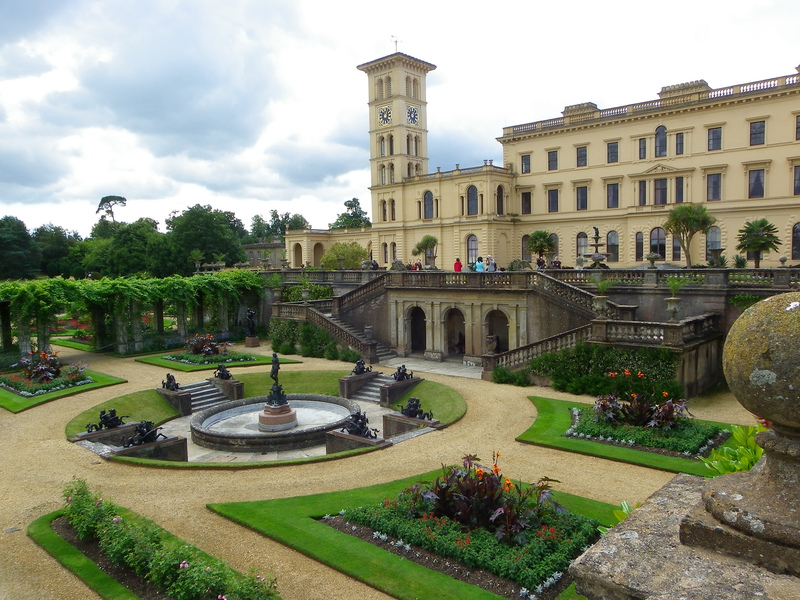 Known for its role in the lives of Queen Victoria and Prince Albert, Osborne House lies on the Isle of Wight. Royal History. Owned by Lady Isabella Blachford, Victoria and Albert bought it in 1845 for £28,000 to use as a summer residence and country retreat, Sir Robert Peel having recommended the estate to the Queen. The couple soon realised the house was too small for them, though they loved the views that the estate gave of the Solent; the solution was to rebuild the house. The square wing of the house, called the Pavilion, contains the Royal apartments and nurseries, while the main wing accommodated staff and audience rooms for the Queen. Victoria and Albert wanted to bring their children up in a natural and loving an environment, as far as being Royal allowed; this meant the children visited their parents in their bedroom, something unusual for upper-class children. Victoria bemoaned as she stayed at Windsor that she longed for the ‘cheerful and unpalacelike rooms at Osborne’, showing a preference for a simpler life. The couple’s eight children had their own retreat in 1854, when the Swiss Cottage was finished, and the ninth addition to the clan came along in 1857. The large timber playhouse, based on the design of a continental cottage, was kitted out with child-size furniture, a fully-functioning kitchen and decorated with rustic carvings and German proverbs. Each child was given a small plot next to the cottage in which to grow fruit, vegetables and flowers. This produce would then be sold to their father. Albert was hoping to teach his children basic economics. The kitchen was used to teach the children cooking skills, as another way to keep their children grounded despite being Princes and Princesses, many destined for ruling nations across Europe. The family stayed at Osborne in May for Victoria’s birthday, and during July and August of each year. They would also spend a short time there before Christmas. Again, showing a more typical middle-class family, Victoria and Albert regularly invited photographers to capture family moments at their seaside home to use for personal pleasure, but many prints were sold to the public too. Formal gardens were created around the house, in addition to the remodelling of the parkland and pleasure grounds; at the bottom of the gardens, roughly 1km away, is a private beach, where the family would bathe in the sea – using bathing machines, of course, since anything less would have been too scandalous. Albert supervised all of these improvements at Osborne, whilst undertaking official duties as well as improvements at Frogmore, Windsor and Balmoral. In 1860 stables were built while the old stables were remodelled to provide further kitchen facilities and accommodation for staff. In 1861, Albert died at Windsor, and Victoria retreated from public life to both Osborne House and Windsor Castle. It wasn’t until she was advised by her uncle, Leopold, King of the Belgians, that she ought to be seen by her subjects, did she begin to make public appearances once more. Government House in Victoria, Australia, was, interestingly, built in honour of the Queen as a copy of Osborne in 1876. 1880 saw the building of a private chapel, followed by an extension of the male dormitory in 1887, in order to accommodate the numerous Indian servants in service towards the end of Victoria’s reign. The last building works came in 1892, when the Durbar Wing was built, containing the Durbar Room: an Indian-style room, elaborately detailed. You may view an image of the room here. It is filled with Indian items, including artwork, ornaments and furniture. The first floor of the new wing was created for Princess Beatrice, the youngest of nine, and her family. After her death at Osborne itself in 1901, Victoria left instructions that the house and estate remained in the family. Sadly, no one wanted it, and Edward VII left it to the nation as King; Princess Beatrice and Princess Louise both kept houses on the estate, but the remainder of Victoria’s children were not interested in neither visiting nor keeping the estate. The house then functioned as a Royal Naval College between 1903-1921, and three of Victoria’s grandchildren (future Edward VIII, George VI and their sibling, George, Duke of Kent) attended training here. World War One saw the lesser wings of the house turned into a convalescent home, which many stately homes of the era did too; Osborne played host to A.A. Milne, creator of Winnie the Pooh, and author Robert Graves during this time. In 1954, Queen Elizabeth gave permission for Victoria and Albert’s the private rooms to be opened to the public, and the house went under restorative work in the 1980s. Today the estate is cared for by English Heritage, but is owned by a trust with connections to Historic Royal Palaces. It is open to the public, and the former cricket pavilion used by the Naval College is a holiday let, giving guests exclusive use of Victoria’s private beach. Osborn is even available for wedding ceremonies. Items on display include gifts commissioned by the couple to give one another, and plaster casts of the childrens’s limbs that Victoria and Albert had made, giving an intimate look at the Royal couple’s life and family. Also featured are numerous items of Indian origin, given as gifts to Victoria as Empress of India.